It’s that time of year again! 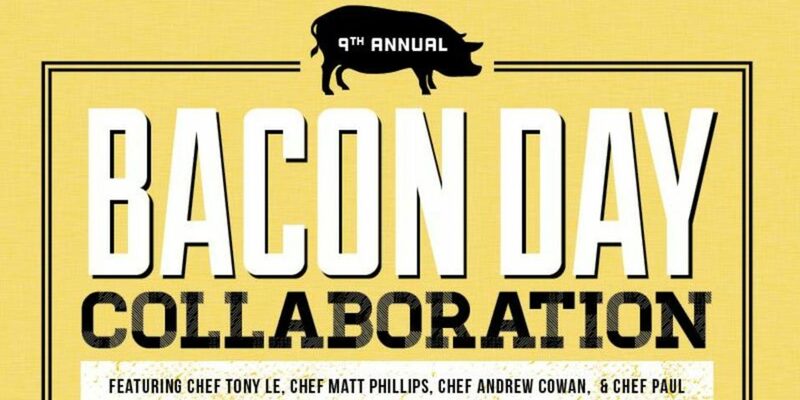 The 9th Annual Bacon Day Collaboration, featuring Chef Tony Le, Chefs Andrew Cowan and Matt Phillips of Northern Chicken, and Chef Paul Shufelt of host restaurant The Workshop Eatery, will take place on Saturday, September 15–and they hope it will be the most successful to date! Chef Paul Shufelt and The Workshop Eatery feel so fortunate to have the support of their community, and they want to show their gratitude by giving back. Last year Bacon Day raised $25,000 for YESS. This year, as always, all proceeds from Bacon Day will be donated to support YESS programs and the goal is to raise $30,000! This year Bacon Day will see the return of the whole roasted pig, the patio and restaurant will be open with delicious tray-passed foods items and wine-inspired food stations. DJ Hector Castro will be spinning and there will be a silent auction. And of course there will be the Bacon Dessert cook-off! For tickets and more information visit the Bacon Day event page!